Wow, yet another friend of The Garage who has a book fresh off the presses. So fresh in fact that Lauren Fix’s Guide To Loving Your Car hits the bookshelves tomorrow! Known as The Car Coach, Lauren Fix has had a love affair with cars all her life. She has done it all in the car industry, from turning wrenches to driving instructor. She has done guest spots on just about every major market TV network you would care to name. Oh, and did I mention that Lauren has been racing cars since 1981? Not just any cars however, as this lady’s regular drive is a 1992 Riley & Scott Trans Am car! In her Guide to Loving Your Car, Fix takes a laid back, comfortable approach that ensures that the book will appeal to everyone who drives, not just gearheads. In fact, I would hazard a guess that part of Lauren’s goal with this book was to take some timid new drivers and impart that love of cars that drives so many of us. You will find Lauren Fix’s Guide to Loving Your Car in your favorite book store tomorrow and you can visit Lauren’s home page to learn more. Koen Vergeer is a motorsports writer & poet who was born in the Netherlands in 1962. Just a few years older than me, his viewpoint on Formula 1 is relevant to my own. Formula 1 Fanatic is his explanation of what made him become an F1 fan & perhaps what has kept the fans coming back over the years. The book begins with an attempt to describe the Dutch perspective of F1, but for me it really starts part way through the first chapter. At this point, Vergeer describes his first visit to Zandvoort. The sights, sounds and smells leading up to the start of the race. Witnessing his first crash and the death of a driver. It made me think of my early childhood. Sitting in a Shadow CanAm car, meeting Jacky Ickx, seeing my mom in giant bell bottoms & a floppy Coke hat. Seeing my father rush off to help the marshalls in a failed attempt to save a dying driver. What follows is a wonderfully written history of Formula 1. Vergeer’s research has yeilded tale upon tale, with many candid quotes from driver’s and owners alike. Perhaps he lavishes too much attention to Michael for my liking, but then again, perhaps his analysis of the elder Schumachers’ impact on the sport is spot on. 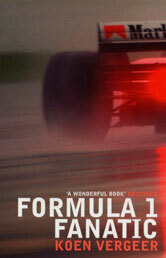 Formula 1 Fanatic was a great read, one that I heartily recommend to any Formula 1 fan. For the old guys who want to relive some memories & the young guys who really should understand what it is they are getting all excited about.